Aqua Suites, located in Imerovigli village on the island of Santorini, offers 4 unique units, privacy, comfort, facilities most often found in a boutique hotel and personal service that will make your stay most memorable. This is just the place to stay for your honeymoon or for a romantic island getaway. Spectacular views from Aqua Suites to the Aegean Sea, the Caldera and the volcano elevate Aqua Suites to stand proudly amongst the world greatest locations. 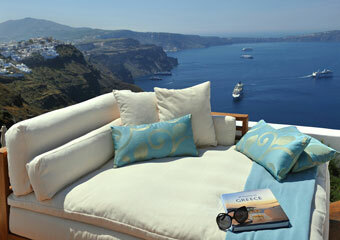 Experience Santorini at its best - live the experience of Aqua Suites. Its spacious suites, a unique characteristic in the area, are equipped with a private Jacuzzi (indoor or outdoor) and offering crystal clear view to the island, volcano and the Aegean Sea. Furthermore in all the rooms Aqua Luxury Suites has the pleasure to offer many facilities. Well equipped kitchen (including SMEG cooker, large fridge, Espresso & Frappe coffee machines, kettle, cutlery & crockery). Living room is furnished with a comfortable linen couch, several soft cushions, uniquely designed coffee table, full length mirror, Plasma TV, DVD player, home cinema system, Satellite TV channels, an i-pod docking station and air conditioning (individually controlled). Master Bedrooms have a king-sized automatic adjustable bed with massage settings (back & feet levels adjust as you desire). Bathrooms have a shower, hairdryer and shaving socket. Bathrobes, slippers, bath towels, beach towels and luxury amenities are provided. Luxurious Italian linen & towels are changed twice daily. Housekeeping is also twice daily. Private deck has a Jacuzzi, deck chairs, coffee table and a wooden lounger with comfortable cushions. All verandas enjoy panoramic sea views, view to the volcano and to the Caldera. All guests of the hotel have a private transfer from the port/airport, flowers and a chilled bottle of champagne upon arrival. The Aqua Junior Suite is an open plan suite (45sqm) with a double bed, bathroom with shower, spacious covered balcony (20sqm) furnished with a built-in sofa with pillows, table and chairs and has a wonderful views to the sea, the Caldera and to the volcano. After the recent renovation this Suite has an outdoor heated Jacuzzi! The Aqua Junior Suite can accommodate up to 2 people. While the Aqua Junior Suite offers complimentary Wi-Fi, a Plasma TV, DVD player, home cinema system, Satellite TV channels, an i-pod docking station, radio, safe box and air conditioning (individually controlled) and luxurious bathroom amenities, this Suite does not have a kitchen. The Aqua Junior Prive is a suite (50sqm) with a double bed, bathroom with shower, private balcony with indoor/outdoor jacuzzi. The Aqua Exclusive Suite is a double storey suite (90sqm). The entrance level has an open plan living room with a large comfortable sofa and kitchen with dining table. The large outdoor heated Jacuzzi is also on this level, on a large private deck (30sqm) with magical sea views, views to the Caldera and the volcano. This deck is furnished with 2 sun beds, 1 lounge chair and a dining area. The lower level has two separate bedrooms (master bedroom with a king sized bed another with a double bed) and a bathroom with shower. The Aqua Exclusive Suite can accommodate up to 4 people. The Aqua Honeymoon Suite is a Suite (50sqm) with king-sized bed, Santorini traditional sofa, a large private balcony furnished with outdoor table and chairs. It has also an Outdoor heated Jacuzzi and bathroom with shower. Enjoy the sea views, views to the Caldera and the volcano. The Honeymoon Suite with outdoor Jacuzzi can accommodate 2 to 3 people. The Aqua Grand Suite is a double storey suite (110sqm). The entrance level has an open plan living room with large comfortable sofa and kitchen, WC, bedroom with double bed and a large private deck (60sqm) furnished with comfortable outdoor sofas and a dining table. The Jacuzzi on this deck is right on the edge of the Caldera! The upper level has the master bedroom with king sized bed, bathroom with shower and a private balcony with a hammock. The Honeymoon Suite with outdoor Jacuzzi can accommodate 2 to 4 people. All suites at Aqua Suites offer complimentary Wi-Fi, a Plasma TV with satellite channels, DVD player, home cinema system, an i-pod docking station, radio, safe box and air conditioning (individually controlled), luxurious bathroom amenities and a kitchen equipped with a SMEG cooker, large fridge, Espresso & frappe coffee machines, kettle, cutlery & crockery.